← If You Could Only Choose 5 Foods, What Would They Be? When I help people understand the principles of the DASH Diet, I emphasize eating more vegetables, fruit and lowfat dairy. But I also must mention that saturated fat, sodium and calories are important too. Sometimes folks will ask about reading food labels, and how to choose a food based on its label. This is always tricky, especially if you don’t have a food label in hand, or are asking about a specific food or food group. It is important to glance at the serving size on the label. This serving size is the amount of that food or beverage in which all of the following information (calories, grams and milligrams of everything) is based. If you eat double the serving size, then double up all of the other information as well (see the bread labels below – one bread labels 2 slices as one serving; the other labels 1 slice as one serving). We can argue as long as the day is long about what a calorie is, or if a “calorie is a calorie”, but as you age, you do need to be paying attention to calories. Yes, it is difficult to eat 300 calories of broccoli, and quite easy to eat a 300 calorie banana muffin, so while calories differ in terms of the foods they are delivered by, the total calories still matter. In general, you don’t need to “count” calories in the whole fruits or vegetables you eat. Eat more of them – as much as you want. But other food groups – especially the meat group and the bread and grain group – you do need to be more aware of daily portion sizes. The Nutrition Facts label will have several lines on it about fat: Total Fat, Saturated Fat, Polyunsaturated Fat, Monounsaturated Fat. A recently published meta-analysis determined that saturated fat may not have the strong correlation to heart disease risk as previously believed. This is still under fierce debate and it’s still prudent to limit your saturated fat intake which will primarily keep LDL (low density lipoproteins, or ‘bad’ cholesterol) levels low, as well as including a variety of fats in your diet. Portions and balance are also important. Finally, sodium is found in a multitude of foods. The DASH recommendation for sodium is 1500-2300 milligrams daily. It’s quite a challenge to keep your sodium intake this low, and rather than “count” milligrams of sodium everyday, I encourage you to gradually reduce your intake by becoming aware of the sodium in packaged foods that you use. Read the labels – again, checking the serving size first, and then the sodium content. Surprisingly bread products contribute a large amount of sodium to the diet. I am a fan of carbohydrates, so I won’t bash bread, but you do need to be aware of the fact that the more servings you eat daily, the higher your sodium intake may be. Compare different brands of your favorite breads, and try to choose lower sodium ones more often. See the food labels below. One is a standard Italian sandwich bread, the other a standard wheat sandwich bread. You will note that at a glance you may only look at the sodium content, and think “oh, this bread is higher in sodium” But upon further analysis, you’ll see that one brand shows one serving to be two slices, while the other shows one serving to be only one slice. This loaf shows 1 serving = 2 slices. 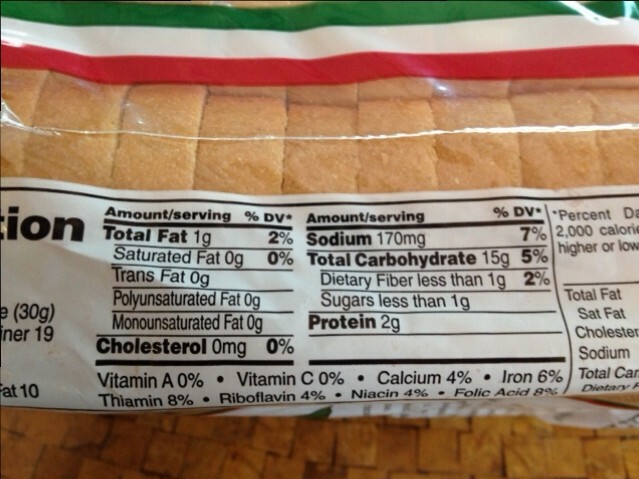 Therefore each slice contains 115 mg sodium, and 65 calories. 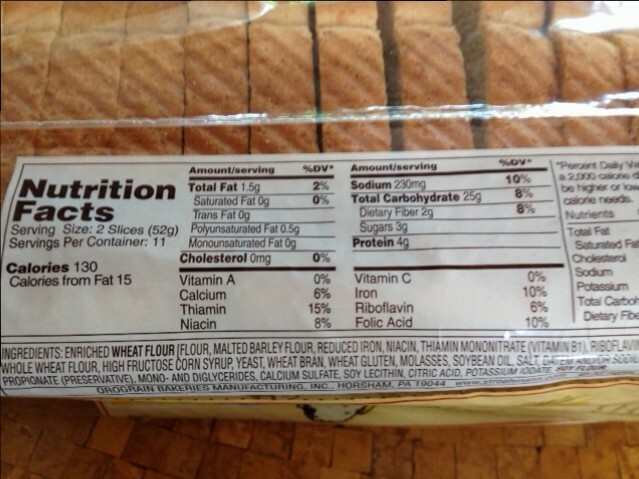 This bread shows 1 serving = 1 slice, therefore each slice contributes 80 calories and 170 mg sodium. More calories and more sodium. If you have diabetes, you may also be interested in looking at the carbohydrates, or the sugars line, but in general, I feel this isn’t the best way to gauge diet quality when reading labels. Whether you have diabetes or are overweight and at risk – calories (and thereby portions) are most important. People with diabetes should consumer a ‘low sugar’ diet, but do not have to avoid all foods with a “grams of sugar” in them. So by checking the portion sizes on a package, you’ll be controlling calories (and sugar). My recommendation in terms of limiting sweets is not to over-analyze every 4 grams of sugar on a food label, but to limit your portions of obviously sweet foods and beverage. You know what a “sweet” is right? Foods such as candy, cake, pie, cookies, muffins, sweet rolls, soda, fruit juices and drinks – are all sweet foods. They all contain a good bit of sugar. So rather than get hung up on how much sugar is in catsup or salad dressing, or your favorite cracked wheat bread – just limit the obvious sweets (both portion and frequency). For example, a 12-ounce serving of soda provides 38 grams of sugar, so this puts the 1-2 grams of sugar in a slice of bread or the 1-4 grams of sugar in a tablespoon of salad dressing, in perspective. Of course a 12-ounce diet soda has 0 grams of sugar. Choosing a variety of foods to eat each week, and eating smaller portions of higher calorie foods (huge sandwich buns, huge bakery muffins, chips, candy, baked goods, large orders of fried food, etc) is the easiest way to ensure a balanced diet that provides the calories and nutrients your body needs. Rather than getting hung up on questions such as “butter or margarine?”, just use small amounts, of a variety of fats (olive oil, or other vegetable oil, butter, spread margarine). Instead of worrying about whether bananas cause belly fat (they don’t by the way! ), choose a variety of fruit. Mix it up – have a banana with breakfast one day, sliced melon another, and add blueberries to your oatmeal on another day. Limit portions of packaged foods, and add more fruits and veggies into your diet in any portion, and you will be on the road to a healthier you! No guilt, no deprivation. This entry was posted in DASH Diet/Wellness, Food Facts, Heart Disease, Misc, Weight Loss and tagged bread, dash diet, heart healthy food, nutrition facts, sodium by Rosanne Rust. Bookmark the permalink.